We all think we can recognise 'quality' in a piece when we see it, and quality usually speaks for itself. Such is the case with the longcase clock pictured here. It is very obviously a grand late eighteenth century longcase in the finest mahogany and with the extra feature of a rolling moon, one of the very best of the north-western style clocks of this period. The condition can be seen to be excellent. It was often the case in fact that a costly clock was bought by an owner who could afford the type of house where his furnishings were cherished, which can mean that high quality items stood on a wooden floor and were dusted and generally cared for in contrast with the hard knock-about life a cottage clock had, as it stood on damp, stone-flagged floors. 1. Full view of the John Wood clock, its quality instantly obvious in the grand style, fine woods and lavish inlays. Click for closer view. 2. The hood in close-up shows a little more detail, such as the twin front pillars, a localised 'Liverpool' feature, as well as the enamel plaques which serve as swan neck terminals. Click for closer view. The case can be seen to be finely made, and in a style which is typical of the best Liverpool clocks of the late eighteenth century - twin pillars to the hood (two on the door two to the side of it) are a Liverpool feature. The dial, with its rolling moon feature, was the best version of its day, the best that money could buy at this period, made by James Wilson of Birmingham, who made dials which were not only stylistically tasteful but of extremely durable quality. The clockmaker himself could not make these dials which involved a furnacing process, which meant he had to buy them from a dialmaking specialist. No dials were ever made at any future time to excel those made by James Wilson, so that a 'Wilson' dial has in itself become an indication of some quality. The name of the clockmaker on the dial in that of John Wood of Liverpool, who is known to have been working there by 1795 and was still making clocks there till about 1828. Such is fairly obvious, but this particular clock has more to it, an attribution which puts it more excitingly into its historical context. The terminals of the swan neck pediments, which on all clocks of this style have some sort of decorative roundels (sometimes wooden roundels, sometimes carved flower-heads, sometimes brass paterae), on this example have porcelain plaques. These plaques carry an image of a galleon, a warship in full sail, above which are the words 'Admiral Nelson' and below 'Vanguard, 74 Guns, Augst. 1st 1798'. This suggested to me that the clock was made within a year or two of 1798 for someone who served on that ship at the time of this particular battle. HMS Vanguard was Nelson's flagship at the Battle of the Nile, sometimes called the Battle of Aboukir Bay, or Abouquir as the French spelled it, though they sometimes called it the Bay of Bequieres. A flagship was any ship, which happened to have the Admiral on board, and on this occasion it was the Vanguard. I was not very informed about this battle and had to turn for help to the Nelson Society, who have many publications on the subject, including a booklet on the Vanguard itself. 3. The dial itself, made by James Wilson of Birmingham, the best dialmaker of the day if not of all time. Appropriately a ship of the line features between the moon faces. Click for closer view. 4. This close-up of the trunk of the clock gives more indication of the quality of the veneers chosen, and shows the marquetry roundels, the stringing, and crossbanding, all immaculately preserved. Click for closer view. The Vanguard, sometimes called Vanguard of the Nile to distinguish her from earlier vessels of the same name, was built in 1787 as a third rate ship of the line, which meant a ship powerful enough to form a part of the line of battle. Only ships with more than seventy guns were qualified for this. The term 'third rate' indicated its classification by the number of guns: a first rater had over one hundred guns, a second rater between eighty-four and one hundred, a third rater between seventy and eighty-four. All the British ships in the battle of the Nile were third raters. Some of the French ships had considerably more, with the French flagship, l'Orient, having a massive one hundred and fifty. The Orient's sheer fire power was ultimately partly the cause of her destruction, as the British scored a direct hit on her powder magazine, which caused such an enormous explosion it was heard thirteen miles away, as well as extreme loss of life. Even the British were shocked at the terrible destruction, and Nelson gave orders to rescue French sailors, this being the first time this is said to have happened in a naval battle. Details are preserved of the names and ranks of all the Vanguard crew, which numbered 445, of which fourteen were officers. If this clock was made for a seaman who served on this ship, it is unlikely to have been a common sailor, who could never have afforded such a luxury item, but an officer. Details of the age and birthplace of each naval rating are preserved, which would help in tracing any Liverpool connection. But the officers were thought to be above such matters, and these details were not recorded for them, the very people we wanted them for. I could trace no Liverpool connection with any of them. The enamel plaques on this clock recording this vital British victory are not unique. One other pair, and only one, is known to exist featuring this same battleship and inscription. These are in the Royal Navy Museum at Portsmouth, and in fact are set on stalks to serve, it is believed, as cloak hangers or possibly as sword hangers - nobody seems to be absolutely sure about that. 5. 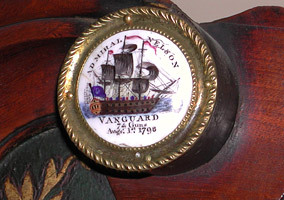 One of the porcelain plaques, which reads above the galleon 'Admiral Nelson', then below it 'Vanguard 74 guns, Augst 1st 1798'. This was the date of he Battle of the Nile. Click for closer view. We will probably never know for whom this clock was made. Could it even have been made for Nelson himself? Or more likely for one of his officers serving on that ship on that eventful day? This clock is available for sale.